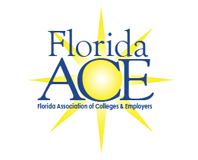 The Name of this organization shall be “Florida Association of Colleges & Employers” (FloridaACE). To encourage professional experiential education, career planning and employment for the individuals educated by institutions of higher education in the State of Florida. To promote high standards of work, ethical practices, and the general professional improvement of its members. To engender greater understanding and cooperation between individual institutions of higher education, and employers in their combined experiential education and employment efforts, through an exchange of ideas, information and experience. Regular Members are experiential education and career services representatives, career counselors from institutions of higher education, and employers who are engaged in the selection and employment of students and alumni from institutions of higher education located in the State of Florida. Student Members are individuals 1) enrolled in graduate programs at a college or university within Florida, 2) who have demonstrated an interest in the career services/human resources profession, and 3) who are not already employed full-time in the profession. Honorary Lifetime Members are those who have made a notable contribution in the field of cooperative education or career services, or to the Association, and are so elected by the Executive Board. All past presidents of the Association and Brownlee Award Winners shall automatically be made Honorary Lifetime Members. B. The Secretary shall coordinate and oversee the membership registration and renewal processes. C. Membership shall terminate when a member becomes ineligible or is delinquent in the payment of dues. Membership may be transferred to a successor upon request to and approval by the Secretary. A former member dropped from delinquency in dues may be reinstated upon payment of dues for the current year. The administrative responsibilities of the Association shall be vested in an elected Executive Board consisting of the Officers, eight (8) Members and the Immediate Past President. A. Officers of the association shall be a President, Vice President, Secretary and Treasurer. The Vice President, Secretary and Treasurer shall be elected by majority vote through an online election process. The office of President shall be filled by the outgoing Vice President and the position of Past President shall be filled by the outgoing President. Regular Members and Honorary Lifetime Members only shall be elected officers. No officer may be elected unless he/she has been a member of the Association for two (2) or more consecutive years. The term of the office for President and Vice President shall be one (1) year. The term of office for the Secretary and Treasurer shall be for three (3) years. No officer shall serve more than two (2) consecutive terms in the same office. The President shall act as chair and preside at all meetings of the Association; shall call all regular and special meetings of the Association; shall appoint all committee chairs; shall be a member ex-officio of all committees; shall appoint a parliamentarian from the membership prior to the beginning of the Business Meeting; and shall recommend to the Executive Board a member to fill an unexpired term of an Executive Board member where a majority in favor of this recommendation will result in the appointment. If the President’s position becomes vacant the Immediate Past President shall fill the unexpired term. The Vice President shall perform all the duties of the President in his/her absence or at his/her request; shall be chair of the Annual Conference Committee, and serves as President-Elect. The Secretary shall keep all official minutes of the Executive Board meetings and the Association business meetings; shall issue invitations and notification as shall be required by the Executive Board, shall maintain the membership database and insure it is made available to members as deemed appropriate by the board. The Treasurer shall keep accurate records of all financial business of the Association; shall present financial statements as deemed necessary by the President to the Executive Board for review, shall submit an estimated budget for the succeeding fiscal year’s operation to the Executive Board for approval; shall make reports as required by the Board; shall pay all bills approved by the President or Vice President; shall receive dues from members and issue receipts upon request. The Executive Board Members shall be composed of the four officers, the Immediate Past President, who will also be the association’s historian, and eight (8) elected members. The eight (8) board members shall be elected by a majority vote through an online process to three-year terms and shall be made up of the two Employer Members, one State University Member, one Community/State College Member, one Private College/University Member, one Professional Development Director, one Information Management Director and one Membership Director. C. Executive Board Members and Officers shall take office on July 1 following the annual business meeting of the Association at which they were elected. D. Vacancy of any position on the board occurring mid-term, with the exception of President, may be filled by a board appointment. Members appointed by the board to any such position shall serve the remainder of the regular term. Elections to fill the position shall be held at the regularly scheduled intervals for said position. A. Standing committees shall be the Membership, Annual Conference and Nominating committees. The Membership Committee shall be chaired by the membership representative and shall carry out the policy and procedural mechanics of membership application and approval as defined in part 3 (III. Membership) of the constitution. The Annual Conference Committee shall be responsible for the program of the annual meeting with the guidance of the Executive Board. This committee shall be chaired by the Vice President. The Professional Development committee shall be chaired by the Professional Development Director and shall coordinate all phases of planning professional development programs for the association. This includes serving as chair of the Program Committee for the annual conference. The Nominating Committee shall be composed of three members. It shall vet and select candidates for Director and Officer Positions. Representative positions shall be selected for the slate by means of nominations or self-nomination. Elections will take place online prior to the Annual Business Meeting and the newly elected Executive Board will be presented to membership during the Annual Business Meeting. This committee shall be chaired by the Immediate Past President. The Site Selection Committee shall be responsible for recommending to the Executive Board, potential sites for future annual conferences. The President shall serve as chair for this committee and sign relevant contracts, and shall appoint Board members to sit on this committee as required. The Communication and Outreach Committee seeks to engage current members and raise the profile of FloridaACE across the state. This includes, but is not limited to, social media management, blog and newsletter dissemination, website content and recommendations, and overall branding of the organization. B. Other committees shall be appointed by the President as deemed necessary based on the needs of the membership as long as the committee’s activities are not in opposition to the goals and purpose of the Association. These committees shall serve for a duration as is determined by the President. A. The Associations shall hold at least one business meeting each fiscal year which will usually occur at the annual conference. Special meetings may be called by the President or by the majority of the Executive Board. The fiscal year is Jan 1 through Dec 31. B. A majority of the Executive Board shall constitute a quorum for the purpose of any of its meetings. C. Only Regular Members and Honorary Lifetime Members shall have voting rights in association business meetings. D. Majority vote is required to pass motions at Executive Board meetings and the Association meetings with the exception of amendments or revisions to the Constitution, which require two-thirds majority vote of the membership present at the meeting or two-thirds of those returning ballots if done by mail. E. The Executive Board may invite special guests to the annual conference. Association members may invite to the conference representatives of their organization and/or their family. F. The Executive Board shall determine the registration fee for the annual conference. Registration and/or other expenses may be reimbursed to or waived from any conference attendee if approved by a two-third vote of the Executive Board present. A. Dues shall be billed prior to January 1 and shall be applicable for the membership year January 1 through December 31. B. Members whose dues remain unpaid by August 1 shall be flagged as inactive in the membership database and will no longer appear in the electronic FloridaACE Directory. A. Amendments to or revisions of the Constitution shall be proposed by the Executive Board, or by any member through the Executive Board. The Executive Board may recommend for or against the acceptance of any proposed amendment or revision but must present all recommendations to the membership. B. Adoption of any amendment to or revision of this Constitution shall be upon approval by two-thirds majority of voting representatives present at any business meeting or by a two-thirds majority vote for those returning ballots in case of a mail ballot. C. Any proposed amendment or revision must be presented to the membership at least 30 days prior to the date of voting.